Open every Friday and Saturday from 9am-4pm. No cheap imitations...just original, great food! Stop in and order one of your favorite old fashioned submarines or our famous pizza. Our menus also has plenty of other choices to satisfy your hunger. At Avanti's in Medina, you also have your choice of Italian dishes from our restaurant. What makes Avanti Special? Family owned and operated, we care. We care about serving you only the finest meals. Using only the freshest ingredients in all our recipes. Fresh sub rolls baked daily and our pasta is made in house. Your meal is made fresh at the time of order. It doesn't matter if you would like a quick lunch, business meeting or fine dining Avanti's can accommodate your needs. Nestled in the heart of historic downtown Medina, NY is one of Medina's premier restaurants, serving authentic Mexican cuisine and providing customers with a taste of Mexican culture. The Rosario family started this restaurant in 2011 with one goal in mind: provide top-notch cuisine and service to people in the Lockport-Medina area. At Mariachi de Oro you can order from a large menu of traditional favorites and authentic Mexican dishes, made from recipes that have been passed down through the Rosario family from generation to generation. Each dish is prepared fresh by our chefs and served by our friendly wait staff. From enchiladas to fajitas served sizzling hot at your table you will find the hardest part of eating at Mariachi de Oro is deciding what to eat first. If you can't decide, skip right to dessert! We also have a full line of chef inspired desserts that are sure to tickle your taste buds. The concept and business of Mark's Pizzeria began in 1982 as one of both necessity and inspiration to the founder, Mr. Mark Crane. Determined to succeed, he secured a few hundred square feet for a pizza operation in Palmyra, NY. It was here that the basic concepts and recipes of Mark's Pizzeria were born. Over twenty-five years and more than forty new stores later, Mark's Pizzeria still is dedicated to its original mission; adherence to the highest levels of customer service and delivery of a consistently superior product. These core values paired with the finest recipes and freshest ingredients lay the foundation for all forty-seven Mark's Pizzeria locations throughout Upstate New York. The slogan, "We Treat You like Family," speaks for itself. Our management, employees, customers and community members are all part of what makes the Mark's Pizzeria family so unique. Our blend of incredible pizza, excellent service, and convenient locations continues to serve as Mark's Pizzeria's recipe for success. Meggie Moo's is an old time ice cream parlor experience. Come take a walk back in time and relive your childhood. A nice place to stop and eat! There is something for everyone on our menu! (Including one darn good fish fry, if we don't say so ourselves) Please come check us out! The Park Grille, located at the corner of Salt Works Road and Park Avenue in Medina, New York, offers a simple alternative to fast food. Whether it’s for your work break, lunch, dinner or a quick bite after one of the kids’ sporting or school events, the Park Grille offers both take out and outdoor seating. Welcome to our family...Rudy's has been family owned and operated since 1988. Our hearts go into feeding you and your families. Just like eating at home...but we don't argue about doing the dishes! Rudy's was built on an ethic of quality. Our ingredients are fresh and top quality. Most of our foods are still made from scratch (and we wouldn't have it any other way). We strive to give you great food for a fair value. Built on trust, we present top quality Kids Meals, Breakfasts, Melts, Wraps, Burgers, Sandwhiches, Dinners ,Salads, Desserts and several other original "diner" type foods. Rudy's is located in the town of Medina, an historic village along the Erie Canal. Once operated as Wolcott's Dairy, and as Sinclair's service station prior to the dairy, the location of our restaurant continues to be a staple of many childhood memories. After a fire destroyed what was known in 1987 as the Midtown Dairy, it was remodeled by the Russo family to be the current landmark of "RUDY'S". Come in and say "hi" and if you need anything..."let us know if we can help". Ice Cream and Produce Stand. 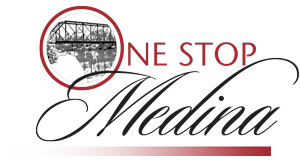 Chef Michael Zambito introduced Historic Medina to exceptional service in a fine dining atmosphere after opening Zambistro in 2006. Boasting seasonal flavors and bold ingredients, the chef creates his own spin on upscale comfort food. Chef Zambito's extensive seasonal menus present a culinary experience that will ensure your devoted return.